Beardsley was just 19 at the time and made 362 different drawings for the project, including designs for full- and double-page illustrations, individual borders, and a large number of smaller chapter headings and numbers. The publication was initially issued in twelve parts at irregular intervals from June 1893 to November 1894. The twelve parts were each covered in grey-green wrappers, and after all twelve had been issued, they could be returned to Dent for binding in book form. The wrappers would be removed and the parts bound together in two cloth volumes. In addition, 300 deluxe copies were printed on hand-made paper and were available for purchase as three volumes bound in either cloth or vellum with a gold floral cover design. Although it was considered only moderately successful at the time, Le Morte D’Arthur was Beardsley’s first significant commission and helped launch his career as a professional illustrator. Through his illustrations for the publication, Beardsley was able to develop his unique early style that drew from a variety of influences—the Arts and Crafts Movement, the Pre-Raphaelite artists, Greek vase paintings, Japanese art, and even interests associated with the Decadent Movement, including death and transgressive sexuality. In this chapter heading, which appears on p. 812 of Book XVII, Chapter XIX, the influence of Japanese woodblock prints is particularly apparent through the use of asymmetry, economy of line, and the flatness of the composition, created by the contrasting black and white fields of color. The illustration also reflects Beardsley’s significant role in the development of Art Nouveau—seen in his depiction of natural forms, such as the stylized tree on the right, and his use of sinuous, curving lines. 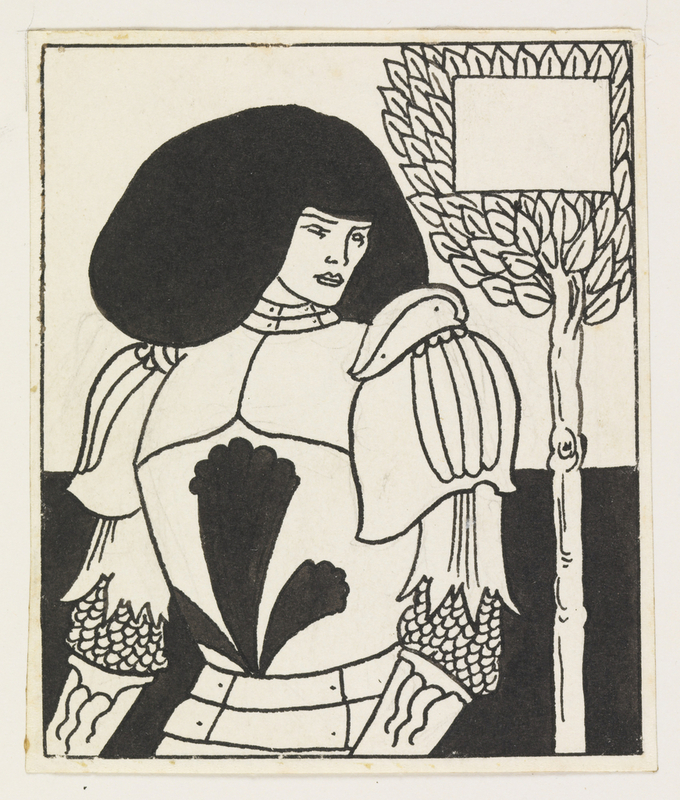 Lastly, the design is significant for its defiance of Victorian norms and expectations; like numerous other illustrations by Beardsley of the knights of Arthur’s court in Le Morte D’Arthur, Beardsley portrays this knight as androgynous or even effeminate, giving him an intriguing sexual ambiguity and challenging conventional gender roles. Joseph Malaby Dent, The House of Dent 1888–1938 (London: J.M. Dent, 1938), p. 67.